How to split one screen into multiple in Chrome and Firefox? 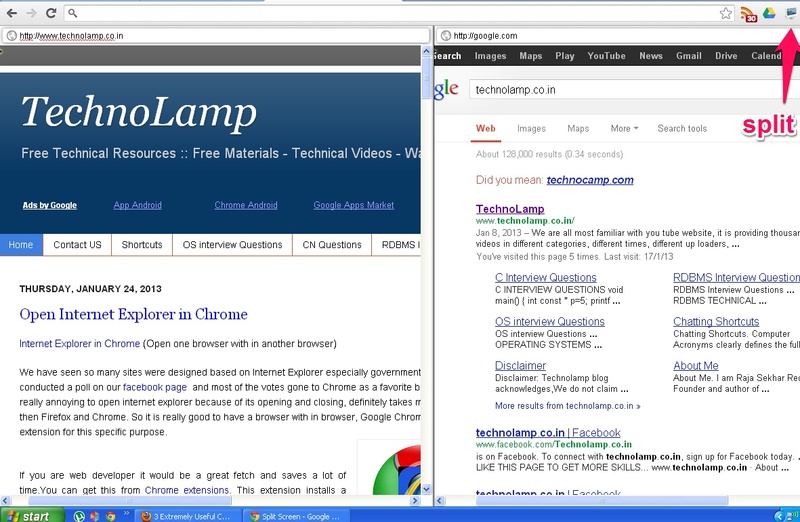 In our previous post we explained how to use Internet Explorer in a Chrome. It is very flexible to work if we divide the screen into multiple sub screens. So let us do the process by adding an extension to the chrome called Split Screen. We generally used to do copy paste of some stuff from one window to another window or writing some thing by using multiple windows, at that time it is really help ful to use. All we have to do is add this extension to chrome. A new icon will appear on top right side of the chrome. If you click on that icon as shown in below figure, the screen will be partitioned in to two. This option is also available in Mozilla Firefox (It's works really good in Firefox than chrome) as split panel. After installing this add-on, Firefox will restart and split panel will works fine. All you have to do is right click on any part of the screen and select split with any of the sub menu options like left, bottom and right. For more available add-on s gor to official Firefox ad-on site.